Click to enlarge each image. 1930 vs. 1958. Stan and Ollie (well, their stunt doubles) ride south down Sunset Blvd. from Grand at the conclusion of Another Fine Mess. Palmer Conner Collection. In 2001 Piet Schreuders wrote to me from his home in Amsterdam postulating (correctly) about the tunnel appearing at the conclusion of Laurel and Hardy’s 1930 comedy short Another Fine Mess. Apart from being an internationally acclaimed graphic designer, and creator of Furore Magazine, Piet’s amazing list of accomplishments include writing The Beatles’ London, a guide to The Beatles’ shooting and filming locations; co-founding The Beau Hunks music ensemble, which recreates the LeRoy Shield musical scores played during the Hal Roach Studio comedies; and creating a virtual reality computer model of downtown Culver City as it appeared when Laurel and Hardy filmed there so frequently in the 1930s. Piet has also tracked down the filming locations for such classic French films as Mr. Hulot’s Holiday (1951) and The Red Balloon (1956). 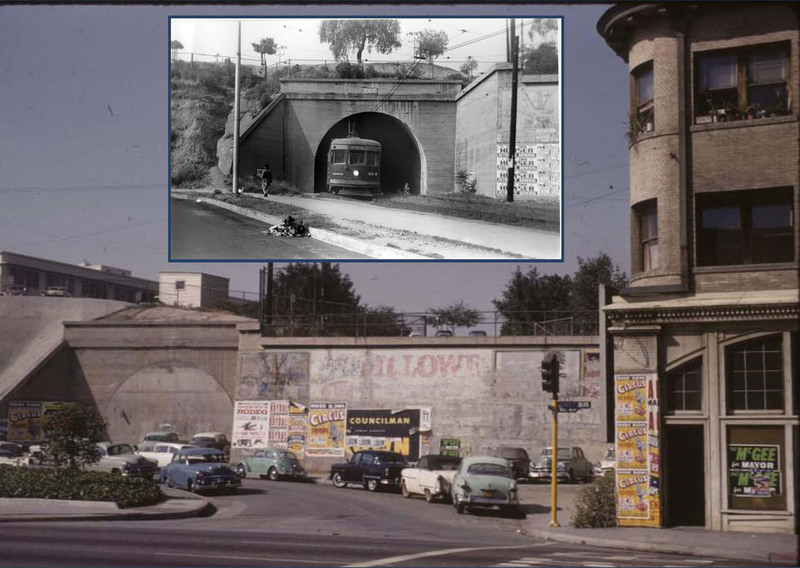 The boys turn south from Sunset, past the Croyden Hotel Apartments, towards the north portal of the northern Hill Street Tunnel. Palmer Conner Collection. Another Fine Mess is a remake of Stan and Ollie’s earlier film Duck Soup (1927), and the first movie to use the background music of Piet’s hero Mr. Shield. The story begins as the Boys hide from the police in what they believe is a deserted mansion. Stan Laurel’s solo appearance beside the mansion in White Wings (1923) – the mansion at 3500 W. Adams – Stan and Ollie dressed as a goat fleeing the home in Another Fine Mess. LAPL. The mansion appearing in the film, still standing at 3500 West Adams Blvd., was built in 1910 by Secondo Gausti, and was later owned by film choreographer Busby Berkeley. The mansion is now home to the Peace Awareness Labyrinth & Gardens and is open for tours. The movie concludes with a cartoon-style joke. Stan and Ollie flee the mansion dressed in a two-person wildebeest costume (don’t ask), then quickly commandeer a tandem bicycle. The police chase the bicycling duo into a tunnel when a trolley approaches. The speeding trolley car strips the police of their clothing, while Stan and Ollie emerge from the other end of the tunnel relatively unscathed, but now riding unicycles, suggesting their tandem bike was torn in two. The Boys pass a distinctive billboard for Mt. Lowe as they continue towards the northern Hill Street Tunnel portal. Palmer Conner Collection. Piet wrote to me with an enticing anecdote from Randy Skretvedt’s classic book “Laurel and Hardy: The Magic Behind the Movies,” where stunt person Joe Mole recalled that he and his brother rode the unicycles for the scene “down by the old Hill Street tunnel.” Based on the series of maps and other materials he provided, Piet correctly concluded that the scene must have been filmed where the Pacific Electric Railway veers south from Sunset into the tunnel running beneath Fort Moore Hill. Views of the tunnel portal before and after it was closed over. Inset Mark Forer. Click to enlarge. The north portal (top arrow) to the northern Hill Street Tunnel running from Sunset to Temple beneath Fort Moore Hill (dotted line). 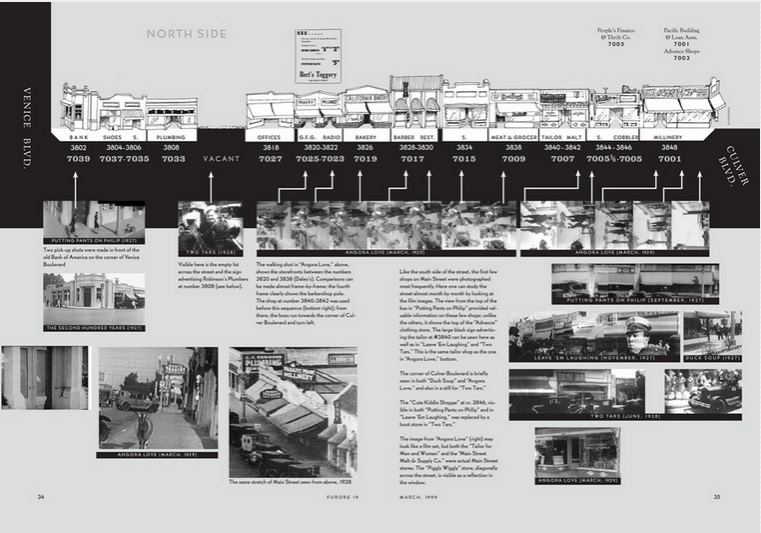 The bottom arrow points to the Broadway Tunnel north portal. LAPL. Los Angeles was a very different place in 1930. Originally cut off to the northwest by a series of hills, downtown LA was difficult to reach from Hollywood and parts west until a series of tunnels were built starting in 1901. 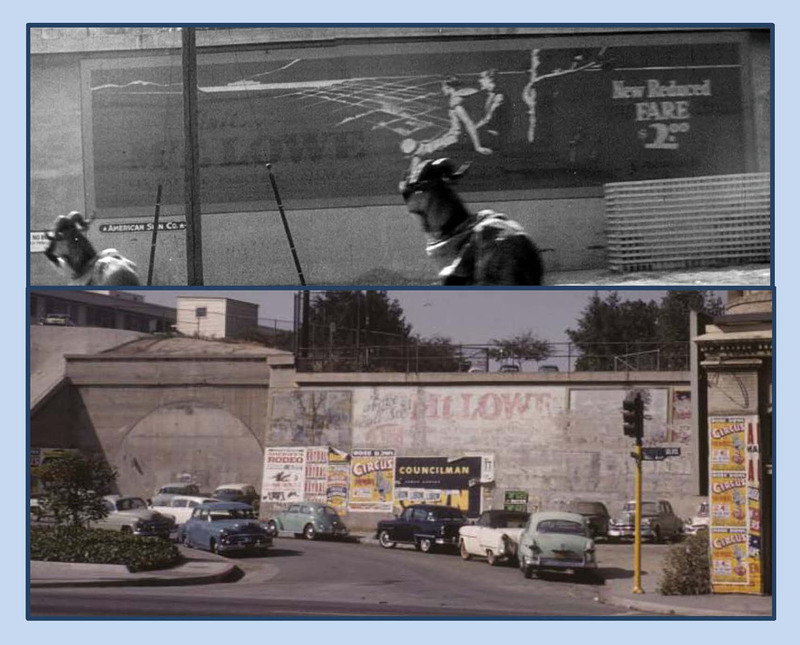 By 1930 a series of six tunnels provided access to downtown; the 3rd Street Tunnel, the Broadway Tunnel, the twin-bore Hill Street Tunnel under Court Hill, the single-bore northern Hill Street Tunnel under Fort Moore Hill, the 2nd Street Tunnel, and the Hollywood subway tunnel running from Beverly/Glendale Boulevards south of Echo Park into the basement of the Subway Terminal Building. Although there were 11 tunnel portals to choose from, given the layout and other characteristics present during the scene, I agreed with Piet’s conclusion. But at the time there were so few reference photos available it was difficult to sense what the area looked like. One thing that struck me watching the scene is that Stan and Ollie pass a billboard advertising the Pacific Electric railway to Mt. Lowe. Mt. 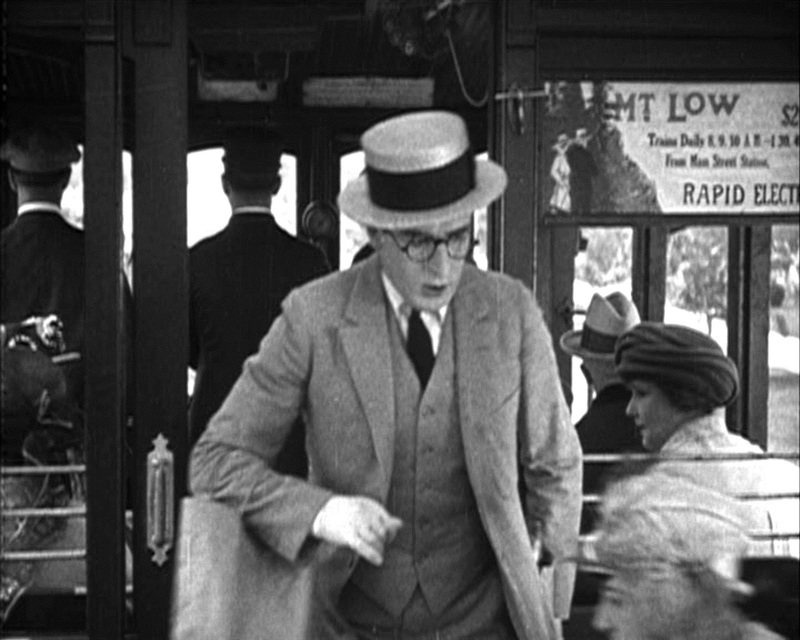 Lowe had been on my radar ever since I became aware that Harold Lloyd once modified a trolley advertisement appearing in Hot Water (1924) to read “Mt. Low_” on the “RAPID Electric.” It’s baffling why Lloyd bothered to revise the Pacific Electric ad, but then only alter it slightly, and so this oddity was something I always remembered. 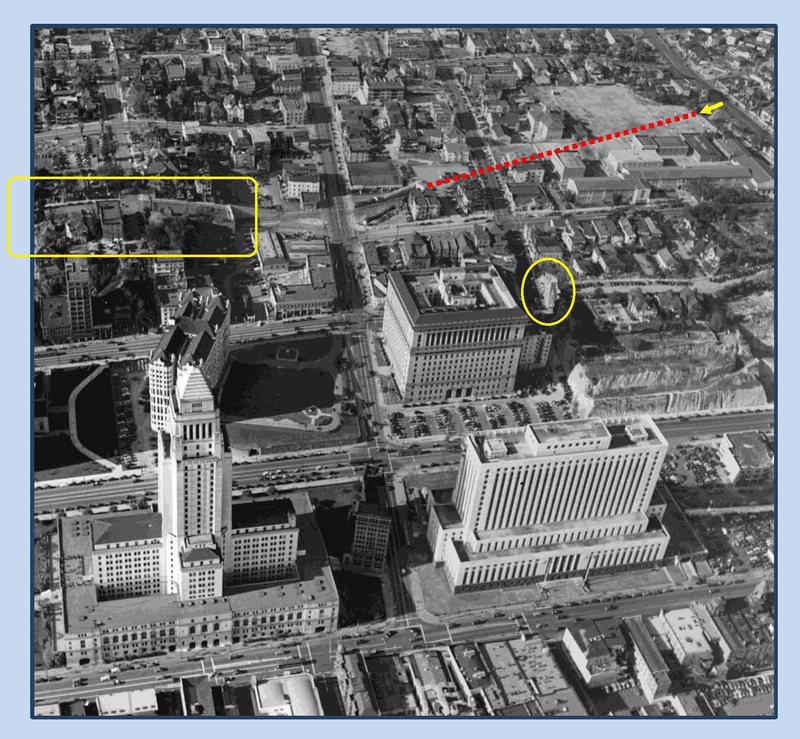 A closer view, riding south down Sunset from Grand (top arrow) then turning right towards the tunnel (bottom arrow). Hill Street snakes around from the lower left corner to join Sunset in the middle of the photo. A great number of vintage photos have become available for online searching since Piet wrote to me in 2001, and one particularly exciting collection is the Palmer Conner Collection of Color Slides of Los Angeles hosted by the Huntington Digital Library. While browsing the collection I noticed a billboard advertising Mt. Lowe. 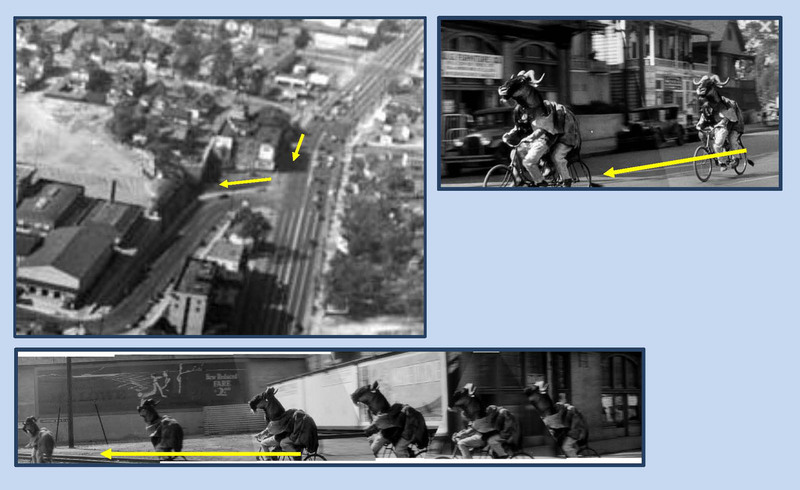 Remembering the Laurel and Hardy billboard, I pulled up the movie frame and found it was a match, confirming the tandem bike entered from Sunset Boulevard into the north portal of the northern Hill Street Tunnel. Likewise, comporting with geographic reality, the unicycles were filmed emerging from south portal of the tunnel, riding towards Temple Street. Another view of the northern Hill Street Tunnel (dotted line) running from Sunset to Temple. The Boys entered at the Sunset portal (arrow). 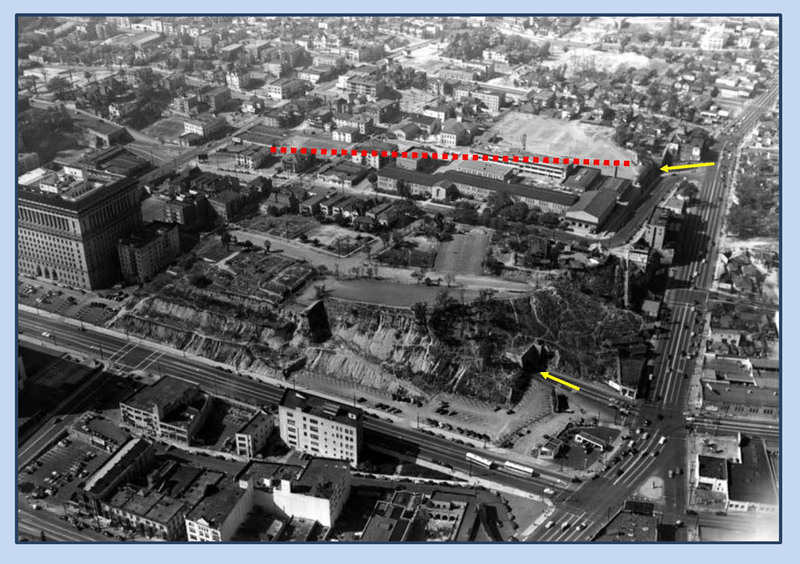 The trolley tracks continued right to left, crossing Temple Street (running down the photo center) until reaching the north portal of the Hill Street Tunnel that passed under Court Hill (yellow box). The tunnel under Court Hill had a second bore just for automobiles. The oval marks the south portal of the Broadway Tunnel. USC Digital Library. 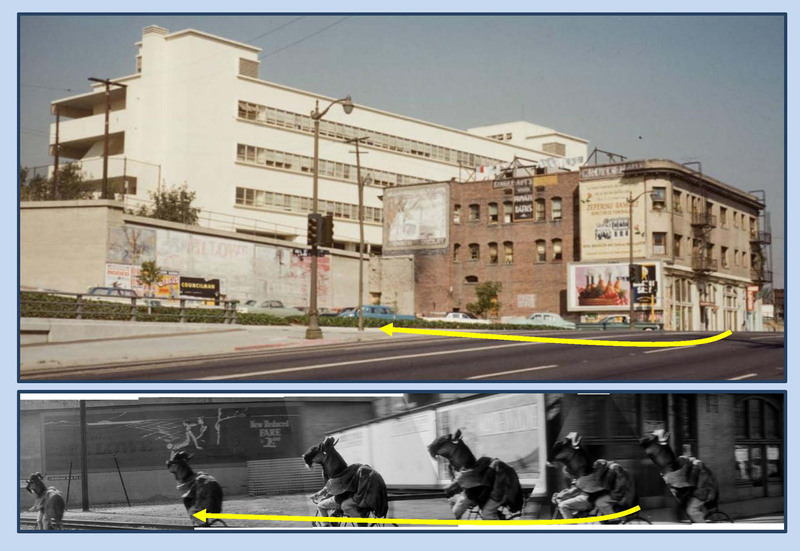 The tunnel ran diagonally SE beneath Fort Moore Hill roughly from Sunset and Grand to Temple and Hill, passing underneath the playground of the Los Angeles High School. For decades after the tunnel was taken from service and the portals were sealed, a central section of the tunnel was used for storage by the Los Angeles Unified School District. This lasted until 2004, when construction of the current Los Angeles High School No. 9 on Fort Moore Hill necessitated filling in the remaining stretch of the tunnel. The Boys exit the southern portal riding towards Temple Street. For more locations earlier in the film (below), Steven J. Margaretic has posted photos of the Boys filming along West Adams in front of the mansion, and riding their tandem bicycle north on 5th Avenue crossing 25th Street, a block from the mansion. Other locations from Another Fine Mess identified by Stephen J. Margaretic at ClassicVideoStreams.com. 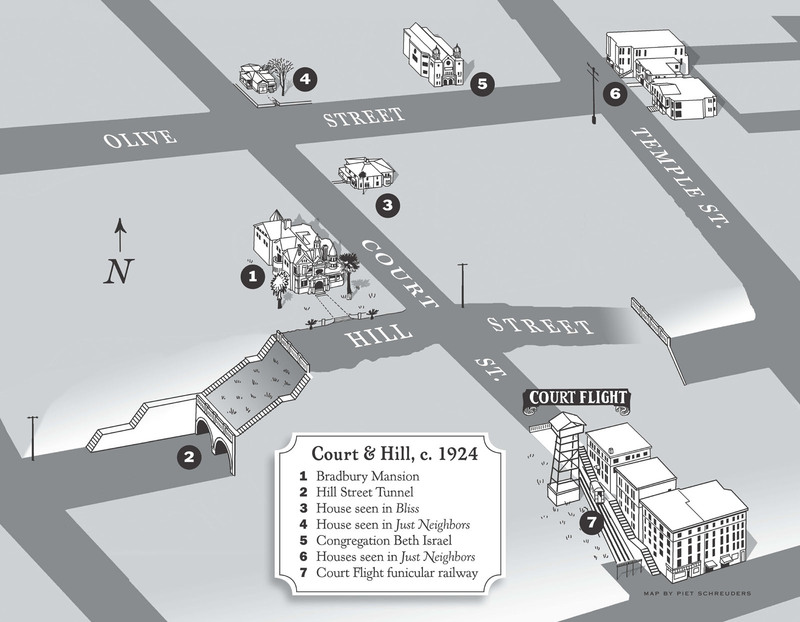 Piet Schreuder’s amazing map of Court Hill, the area within the yellow box three images up. locations appearing in The Red Balloon, HERE, and can purchase his Beatles guide to London HERE. In closing, I also want to thank Piet for the remarkably informative 3D aerial maps that he contributed to my Harold Lloyd book Silent Traces that depict some of LA’s long lost neighborhoods. These elegant illustrations provide clarity and context to those seeking their way into the past. Thank you Piet for your beautiful work. Check out Piet’s virtual reality model of 1930s Culver City here, starting at 3:17. Another Fine Mess (C) Hal Roach Studios, Inc. HAROLD LLOYD images and the names of Mr. Lloyd’s films are all trademarks and/or service marks of Harold Lloyd Entertainment Inc. Images and movie frame images reproduced courtesy of The Harold Lloyd Trust and Harold Lloyd Entertainment Inc. This entry was posted in Laurel and Hardy, Los Angeles Tunnels and tagged Another Fine Mess, Fort Moore Hill, Furore, Hal Roach Studios, Hill Street Tunnel, Laurel and Hardy, Laurel and Hardy film locations, Los Angeles Tunnels, movie locations, Piet Schreuders, Stan Laurel, Subway Tunnel, then and now, White Wings. Bookmark the permalink. FYI, John Bengtson’s blog should be of particular interest to fans of Pacific Electric and LA Railways, since he goes to great lengths to seek out the original filming locations for classic silent comedies. This post in particular mentions a PE tunnel under Fort Moore Hill, and the Mt. Lowe operation. There is also a link to the Palmer Conner Collection of Color Slides of Los Angeles, which includes many interesting views from 1950-70 including Angel’s Flight. It wasn’t a goat costume, it was a wildebeest costume. What was name of Laurel & Hardy film where they try to sell a Christmas tree to a homeowner? Hi Tom – that was Big Business. The locations they used are covered by many websites.